Well, maybe not EXTREME couponing...just my version (: About a year ago I wanted to find ways to maximize our budget. We had two goals...1) To reduce our grocery spending and 2) To begin adding extra items to our pantry to prepare for the unexpected/time of emergency. I began reading tons of stories of families overhauling their spending by using coupons and decided to give it a try. Last year was my first attempt after winning a $250 grocery store gift card and I was amazed at how that $250 gift turned into over $500 worth of product by using coupons. 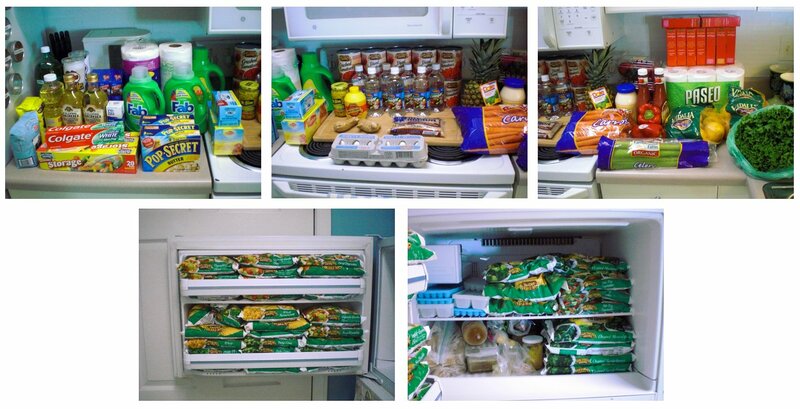 The photo above shows just some of the items we were able to buy. (You'll have to forgive the messy freezer...the frozen veggies took up most of the space and the rest was filled with jars of tallow, chicken fat, frozen broth cubes and ice trays (: I'm so looking forward to the day when we get an additional freezer! I started my couponing journey by studying store flyers and collecting coupons from papers and online sites. It was a tad overwhelming at times because I really had no idea what I was doing (; I always thought couponing would never work for us. We didn't buy a lot of processed food or name brand items and we shopped frugally...or so I thought. We were already receiving free items by taking surveys about our shopping experience (found at the end or back of your shopping receipt) and each month our local natural food store also offered coupons for free products when purchasing $5 or more. Other than that I didn't really understand how the couponing process could work to get the price down for items we enjoyed using...organic, whole food, fresh foods, etc. Turns out my shopping strategy was all wrong. I only searched for coupons on products that we currently needed instead of ones with the greatest possible savings. If you're buying items only when you need them, then you're operating behind the game. I soon learned about saving coupons even when they might not used, buying local and in season, keeping an eye out for sales and special promos and then buying rock bottom...all of which create some pretty fantastic savings. Example...our local store's brand of 16 oz frozen veggies are normally $1.78 per bag. This includes corn, spinach, turnip and collard greens, broccoli, mixed veggies, okra and green beans. Sometimes they're on sale for $1.48 or less, but every so often my favorite low price of $1 appears. That's a savings of $.78 per bag and is the rock bottom price for this item. That's when I buy. I don't purchase a couple for the week, I buy at least 20-30 at a time and stock up for the months ahead when that $1 hits. We didn't use a coupon for this particular purchase and didn't need to because we paid attention to the cycle of the sale. Another example...We LOVE Earthbound Farm and always try to keep our eyes out for their coupons when available. Their 5 oz lettuce boxes go for $3.99 each. Sometimes they're on sale for $3.50 or $2.99, but every so often a BOGO sale appears which makes them around $2.00 each. Sounds great, eh? But what if you planned ahead, had a $.75 coupon (which they currently do) and your grocery store doubles coupons? That means you could get that same $3.99 box for $.50!! That's rock bottom. This was a recent sale for us so we purchased all they had and even got a rain check for 8 more because they ran out. We bought mostly spinach since we can freeze it and the rest were salad greens that we'll be eating on for a while (; Those 18 boxes of organic greens cost us $9.00 compared to paying the full $3.99 price for each one which would have been $71.82. That's a savings of $62.82 by buying low or rock bottom. TIP: When buying lots of fresh greens, wash them when you get home, place a paper towel in the bottom of the box, pile the greens back in, place another paper towel on top and those greens will keep for even longer! We're gluten-free, prefer organic and like to stay away from processed food, but when “fun junk” is free or rock bottom, we get it anyway for parties, the holidays, special celebrations or to share with others. It gives the opportunity of donating to charity or to keep them on hand for family and friends who might enjoy these little treats once in a while. You’ll notice a section at the bottom of our list below full of junk. We don’t normally get this much, but there were a lot of freebies and deals for the holiday. We like to keep our household and food budget in the range of $250-$275 which includes food, cleaning products, personal care, supplements, pet care and food storage (emergency prep). I'm trying to get this down even further, which will happen once we're able to put in a garden and a chicken coop (maybe even goats), but for now we're using coupons to trim our homesteading budget as much as possible. Below is the an example of a month's purchases. The total cost before coupons was $896.65. With coupons, free deals, great sales, brand challenges (buy the name brand and get the store brand free), buying rock bottom and meal deals (buy this and these items are free), we only paid $274.38. That’s a savings of just over 69%. I left out a chunk of items when I first posted, so I updated the list to give you an idea of what is possible. Other than that we do the majority of our shopping at one local store. They have the best prices for the items we use, they double coupons up to $.99, accept competitor coupons, offer gas discounts and have a great selection of organics. Respecting the store's coupon policy is a must and shopping tons of stores is just a bit much for this busy gal (; I like to keep things simple and shopping all over town would drive me crazy...not to mention the gas wasted on store hopping. I still have a lot to learn, but it's a process so I’m being patient with myself (: Once you get the basics down and know what to look for, you'll begin to notice things with little effort. Sales and coupons will begin to jump out at you, even without a list. 1) Set a budget and stick to it - Only spend that set amount and no more. If you have money left over at the end of the month, use it to add to your food storage or apply it to debt. 2) Get to know your store, the prices and their coupon policy. 3) Begin to notice the ebb and flow of sales. 4) Prepare and buy ahead. 5) Only buy when the price is rock bottom or at its lowest. 6) When you're searching for coupons and come across “maybe” items, always save them. They could come in handy later. 7) If you have favorite products, go to the company's website and register for their coupons. 8) Swap coupons with others - I don't know a soul who coupons...go figure! But if you have friends who do, get together and share what you can't use. 11) Operate ethically - We don't agree with UPC matching, using coupons for product that's not stated on the face, using more than one of the same coupon for one item, etc.